It’s not a final, but it’s like. Portugal-Spain, the last game scheduled tonight at 9 PM in Correggio at the U17 European Championship will be decisive for the title. As well as France-Italy will assign the bronze medal at 7 PM. After two rounds of the Medal group, Spain and Portugal lead the ranking with six points, having both defeated France and Italy with large results on Thursday and Friday. More: both teams have the same goal average, but Portugal has a better goal ratio. That means that tonight, in the case of a tie, Portugal will be European Champion again. Something similar happens for the bronze medal. Italy and France have the same goal average too, but Italy has a better goal ratio. The situation in the group for the 5th/9th position is even more complicated. Israel in the only team that will not compete today. It ended its championship in the 9th position, but the improvements of the Isreali team were impressive and Israel is getting more and more competitive every year. Two games will decide the position between the 5th and 8th place and among Andorra, England, Germany and Switzerland everything could happen. Some unexpected results in the Friday’s games kept the four teams very close. Andorra can be 5th winning its daily game at 5 PM against Germany. The first game of the day will be Switzerland-England at 3 PM and the winner will have to wait for the last match to know its final position. 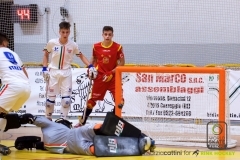 The whole program of the last day at the 38th U17 European Championship in Correggio will be live on Cers-RH TV (www.cers-rinkhockey.tv) starting from 3 PM CET.